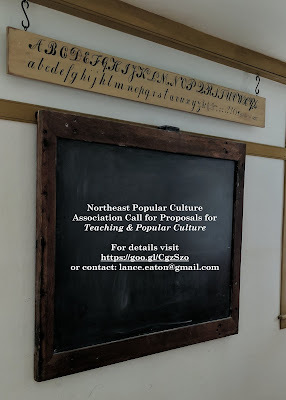 It's that time of year where the Northeast Popular Culture Association (NEPCA for short) is putting out its annual call for proposals for the regional conference at Worcester State University Worcester, Massachusetts, the weekend of October 19-20, 2018. Teaching courses on an area within popular culture (e.g. courses that focus on the content and cultural aspects–not necessarily the “how-to” aspects of comics, video games, horror, Harry Potter, baseball, The Beatles, etc). Teaching mainstream courses using popular culture (e.g. baseball statistics for explaining, statistics, Buffy the Vampire Slayer for explaining political theory, Star Trek for exploring biology). This particular area is focused more on sharing successful and interesting teaching practices for other scholars and educators to learn or borrow from. Therefore, I'm quite interested in hearing from people and encourage anyone who may teach a popular culture focused course or use popular culture in interesting and useful ways to put in a proposal. Here are a few of the formats that I'm interested in seeing and/or participating in. If you have questions or thoughts about these, please don't hesitate to contact me: lance.eaton@gmail.com. So if you are interested, please check out the conference page before going and filling out the proposal form. If you're interested in putting in a proposal that isn't Teaching and Popular Culture, then check out the other areas to determine which is the right area to submit. The Northeast Popular/American Culture Association (NEPCA) announces its first call for paper proposals for its annual conference. The 2018 conference will be held on the campus of the at Worcester State University Worcester, Massachusetts, the weekend of October 19-20, 2018. The proposal should be rooted in research. We do not automatically exclude original poetry, composed works of fiction, or musical/dance/storytelling performance, but such works must be connected to greater theoretical and research frameworks. NEPCA generally avoids proposals whose intent is overtly commercial. Proposals should appeal to a broad audience. NEPCA conferences welcome graduate students, junior faculty, independent researchers, and senior faculty as equals. NEPCA prides itself on offering intimate and nurturing sessions in which new ideas and works-in-progress can be aired, as well as completed projects. NEPCA is dedicated to expanding intellectual horizons, open engagement, and constructive criticism. Papers are generally 15-20 minutes in length. NEPCA discourages (but does not forbid) verbatim reading of papers and strongly encourages creative delivery of papers. The deadline for applications is June 1, 2018. The Program Chair for 2018 is Russ Pottle but, for tracking and logistical purposes, proposals must be submitted to an online Google Form that can be found on NEPCA's Website. This page also includes a link to area chairs who can assist with any questions you have about your proposal.